In the healthcare industry, strong policy management is imperative to ensure your organization is compliant and up to current standards. In the past, this work was often done manually. Now, more and more practices are digitalizing their workflow, making the workday just a little simpler. Automating your policy management guarantees efficiency, security and organization. Here’s a look at how HospitalPORTAL’s Policy Manager can help streamline tasks. The old way: Without a policy manager, physical copies of documents are often printed and stored. Or, they are manually filed in a homegrown intranet, blog or server. These methods have the potential to get messy and disorganized. 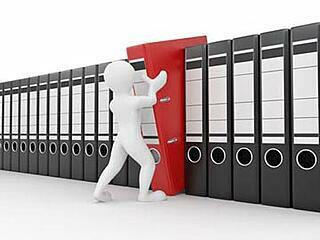 It can be challenging for reviewers or approvers to locate the documents if they are not up to speed on the filing methods. The new way: An automated policy manager does the organization for you. HospitalPORTAL’s Policy Manager contains strong search and navigation tools, allowing you to quickly and seamlessly locate documents simply by typing the name, content, or joint commission number. Additionally, our policy manager can restrict certain documents to only the employees allowed to review them. The old way: When done manually, revising documents can become time consuming. Reviewers and approvers must download, print, sign or make changes. Then, they must scan and re-upload. The new way: Our system contains editing features, allowing you to update and revise documents within the manager. Approvers can approve the revised policies with just the click of a button – as opposed to printing to sign and then re-uploading. Communication surrounding specific policies also just got a lot easier – comments and messages are included throughout the lifecycle of a policy. Additionally, our system contains and extra layer of security that manual work cannot – approvers are locked from approving a document without first opening it. The old way: If each version of a document is not deliberately saved and safely stored, there is no way to save every change to it throughout its lifecycle when manually managing policies. When doing this work by hand, there is a greater chance of missing pieces by forgetting to copy or save as due to being busy. The new way: With our policy manager, you don’t have to worry about saving over old documents or deliberately organizing old and new policies. Our automated system saves and stores each version for you, should you ever need to refer back. In addition, it documents the lifecycle of that policy. The control panel acts as a home base, but also showcases where policies are at in the approval process. Managers have the capability to see all pending action for a policy from their control panel. Users can locate documents or begin working on revising directly from the control panel. The old way: Updating others is done on your time. Emails, organizing and scheduling meeting, etc. While this works, it’s certainly not the most efficient way to get things done. The new way: When a policy is ready to move on to the next step, a policy management system will notify the next employee in the workflow. The automation keeps things direct and organized, and saves you the time of seeking out a different employee. HospitalPortal.net also offers read acknowledgement features, allowing users to know that those next in line have received and reviewed the work.